Over 95 percent of construction waste was reused or recycled in the 2012 Husky stadium renovation. The goal: create an environmentally friendly building while using a sustainable construction plan. The creation of two large retention ponds to filter all wastewater before it enters Lake Washington. Concrete was removed from the lower bowl, crushed on site, and reused for fill under current structure. Compactors for recycle and compost were added to the loading dock, and nearly all concession containers are now compostable or recyclable. The replacement of elevators with spiral ramps. The addition of motion activated LED lighting, low flow fixtures in restrooms and locker rooms, as well as indoor/outdoor suites and clubs that require less heating and air-conditioning. The removal of gas golf carts to transport fans to upper levels seats and elimination of service vehicles inside the stadium. The replanting of existing trees and shrubs after construction. 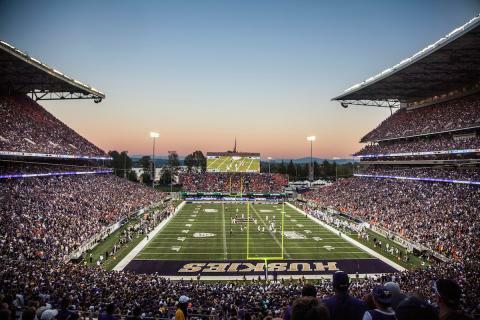 It comes as no surprise that the newly renovated Husky Stadium is expected to receive LEED certification for design, construction, and sustainable operating practices. The 2014 stadium waste diversion goal was reached at 75 percent – that’s a five percent increase from the previous year.